Through a research in algorithmic geometries and production with parametric matrices. 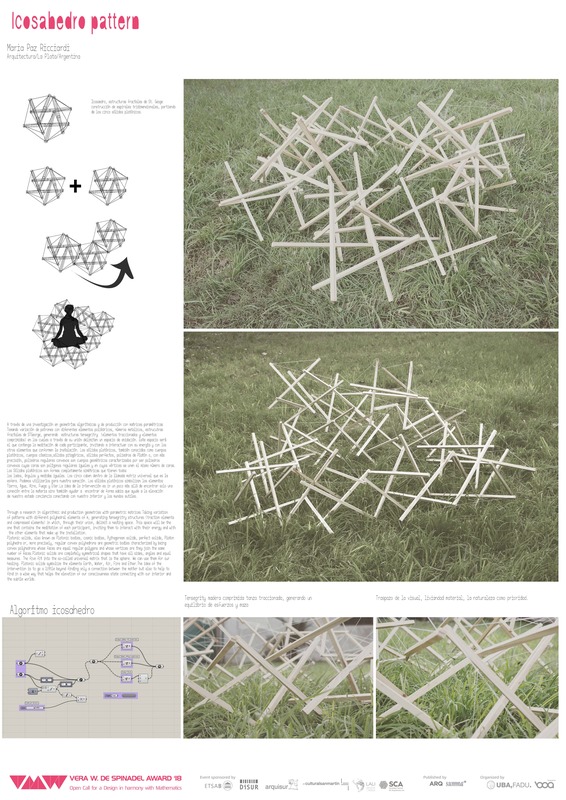 Taking variation of patterns with different polyhedral elements, metallic numbers, fractal structures of STGeorge, generating tensegrity structures (compressed elements and traction elements) in which they join together to delimit a nesting space. This space will be the one that contains the meditation of each participant, inviting them to interact with their energy and with the elements that make up the installation. Platonic solids, also known as Platonic bodies, cosmic bodies, Pythagorean solids, perfect solids, plathedral polyhedrons or more precisely, regular convex polyhedrons with geometric bodies characterized by being convex polyhedrons whose faces are equal regular polygons and at whose vertices they join the same number of faces. Platonic solids are completely symmetrical shapes that have all sides, angles and equal measures. The five fit into the so-called universal matrix that is the sphere. We can use them for our healing. Platonic solids symbolize the elements Earth, Water, Fire and Ether. The idea of ​​the intervention is to go a little beyond finding only a connection between the matter but also to help to find in a wise way the elevation of our state of consciousness connecting with our interior and the subtle worlds.